Note that the Bus runs in the irregular schedule during the following periods. 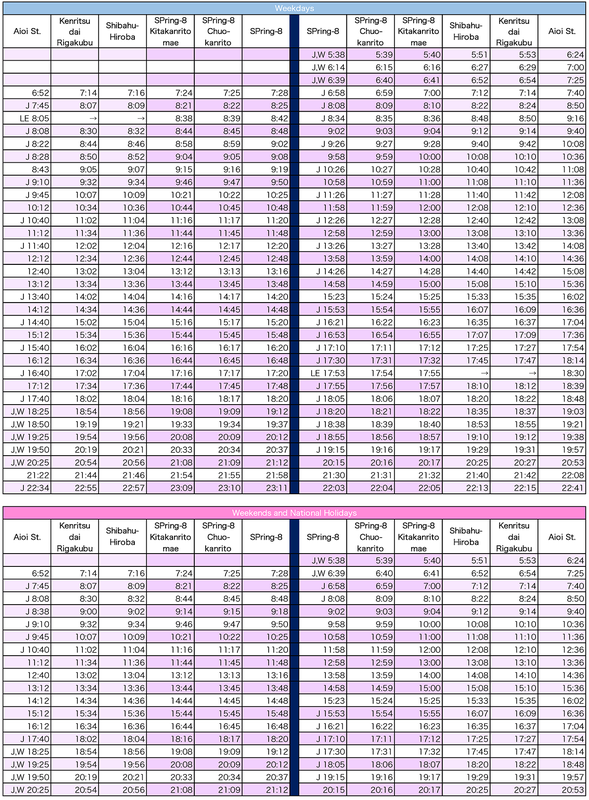 (*) The PDF Time Table for printing is also available. Get off at the Bus Stop "Kenritsudai Rigakubu" to get University of Hyogo (UH) and CAST for meetings, lodging, meals etc. Get off at the Bus Stop "Shibahu-Hiroba" to get Koto-Plaza for Bank ATM's, Post Office, PR Office, Medical Clinic, Dental Clinic, Drug Store, Market, restaurants etc. Copyright © RIKEN/JASRI. All Rights Reserved.